Why have brand stories become such a popular marketing approach? Because, I suppose, humans are drawn more to stories than to marketing. Well, they’re drawn to good stories, at least. Stories that make them care – and wonder what’s going to happen next. That’s the experience of drama. That’s important, because these days, more web designers and agencies are offering to help companies ‘tell their story.’ There’s something naturally appealing about that to a company owner who is proud of the company they built. However, in zeroing in on the brand’s story, I hope they don’t forget the buyer’s story. That’s the one they need to get right, up front on their Home page. Otherwise no one may stick around for the company to tell its own story. The About page naturally is the place to tell the company’s story, plus maybe a brief teaser with a link on the Home page. The rest of the site should mostly focus on the buyer’s story. By this I mean their aspirations, challenges, and dilemmas up to this point; and the happy, successful resolution we want them to imagine, using, of course, our product or service. So, two stories to tell. Yes, a good story makes people think. But it’s the element of drama that makes them sharply focus, makes them relate, makes them feel. According to neuroscientists, most human decisions are based on an emotional reaction. After buying the product we want, we reach for logic and facts that justify that decision. What a funny species we are. 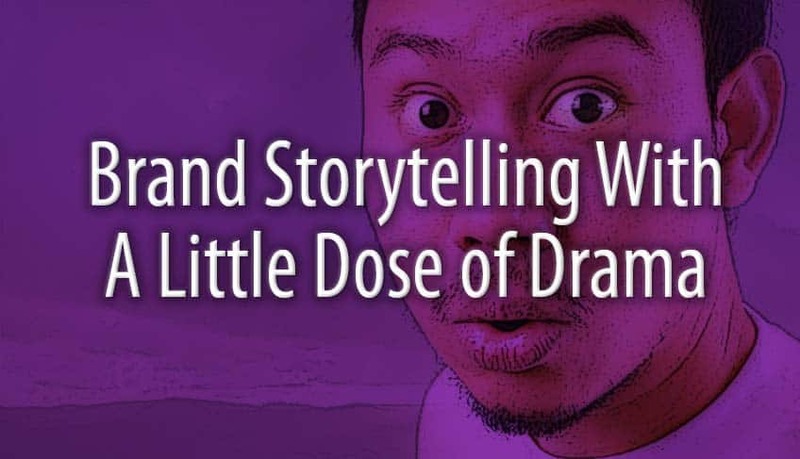 Stories that are dramatic are more likely to grip our attention. And marketers know we’re more likely to take an action when we’re emotionally engaged. Most of the brand ‘stories’ you see on websites, however, aren’t dramatic. An About page that simply documents the company’s history sure isn’t. Neither is a CEO bio that reads pretty much like a resume. Or that stodgy, carefully worded mission statement. In a little bit, we’ll look at four brand storytelling opportunities on your website: For the seller’s story, we have the About page; and for three approaches to their buyers’ story, we have the Home page, case studies, and customer testimonials. Then for each, let’s see how we can inject a touch of drama to get those fickle readers out there to stop, look, and mentally lean forward. Gotcha. Anticipation, tinged with uncertainty. The basics of classic storytelling are really pretty simple. First, we establish the main character, and what they’re trying to achieve or maintain. Optimally, the character is likable and relatable. Next, we introduce the problem, issue or circumstance that’s thwarting their intentions. So, now we have a conflict. Then, the character’s journey in overcoming their challenges comprises the bulk of the story. This culminates in, one expects, some form of final victory. Doesn’t that pretty much sum up the vast majority of the movies you’ve seen in your life? Conflicts are dramatic, because we don’t know which way things are going to go at that point. Anticipation, tinged with uncertainty, right? Now let’s look at some examples of how to apply that classic story template to brand storytelling. Establish: A college student majoring in education has a passion for helping children learn. Obstacle: During a summer job at the county courthouse, she is distressed at the number of troubled teens who have dropped out of school due to what she suspects are developmental problems. Resolution: Despite having a new baby, she manages to earn masters degrees in both Education and Child Development. She then works hard to open her own dual practice that addresses learning and developmental issues together. Outcome: She is uniquely qualified to help the whole child who may be having both of these issues, whereas other child psychology or education specialists can only treat one of them. If you were the parent of a struggling child, wouldn’t you find this story compelling? Wouldn’t it stand out among other About pages that simply listed the practitioner’s college and work history? Remember now, we’re switching to their potential client’s story – the person who is selling their home. Establish: You (the homeowner) may be an elderly person who is trying to sell your home so you can move to a senior living facility. Obstacle: You can’t imagine doing all the repairs and remodeling that traditional real estate agents are telling you to complete. In fact, even the idea of cleaning decades worth of stuff from your home is overwhelming. Resolution: The real estate agent will make a (reduced) offer on your home as is, and if you accept it, they’ll handle the repairs and clean-up themselves before reselling. Outcome: You’ll receive a check for your home, which you can use to pay the new facility, and simply walk away from your outdated, cluttered home. A uniquely focused business model that’s responsive to people’s real-world needs results in a happy ending for both the client, and the real estate agent. Establish: A local homeowner has a nice house, except the roof had a number of broken and missing shingles; rain is starting to leak into the attic and rot the wood, causing even bigger problems. Obstacle: They knew something had to be done soon, but having recently retired, they were too squeezed for cash to afford an entire new roof. Resolution: The roofing company came to do an inspection, and determined that the roof damage was the result of a hailstorm several months ago. The had the expertise to document their findings, which were forwarded to the homeowner’s insurance company. Outcome: The homeowner was thrilled to have a new roof … paid for by their insurance policy. Case studies are a great opportunity to tell stories that make the company shine. But it’s that that bit of drama that makes the outcome that much sweeter. When asking your clients for a testimonial ‘quote’, don’t settle for vague accolades about what a nice company you were to work with. Coach them to specify the problem they had, and how your firm resolved it. This will be far more meaningful for all the other prospects out there who are facing a similar issue. If brand storytelling is here to stay, better stories will offer a competitive edge. The question is, without a bit of drama, is it really a story at all? Brand stories are important, but they’re only part of the picture for today’s marketers. For a wider view of what it takes to truly connect with your audience, read An Atlanta Copywriter Shares 3 Surprising Secrets.